PHOENIX – May 12, 2008 -– Penn introduces its new Pro Penn+ tennis ball, featuring new LongPlay® felt for 25% longer wear* and 19% greater visibility*. New Pro Penn+ also continues to feature Encore Technology™ for a 33% longer lasting core*, making the ball play like new longer. This new innovation takes this popular, tournament-quality ball and makes it even more technologically advanced and beneficial for tennis players. 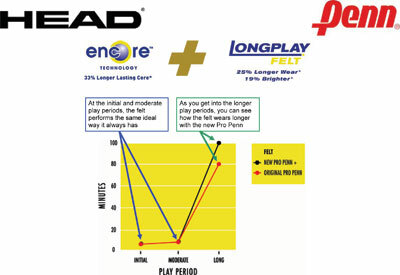 LongPlay Felt is Pro Penn’s new felt that lasts 25% longer* than original Pro Penn. It also has a stain-resistant property, keeping the ball cleaner longer. A key benefit to the new LongPlay felt is that it plays exactly the same as original Pro Penn felt, but just wears longer – therefore maintaining all the positive properties that have made this ball a top-performer from Penn – America’s #1 selling ball. In addition, this ball still features brighter felt for ultimate visibility on-court. You can see from the chart details below how LongPlay felt is longer lasting than original Pro Penn. compound that uses a proprietary blend of natural and man-made polymers to limit ball softening. The core stays fresher longer and therefore “plays like new” longer. “Penn continues to lead the market in innovation with the introduction of new Pro Penn+. We now offer the complete package of a ball that lasts longer from the inside out – from core to felt. The clear benefit to tennis players is to have the ball they know and love last even that much longer – through the most rigorous of lessons, practice sessions or tournament matches,” says Jennifer Parker, Business Manager for Penn Tennis Balls. Pro Penn has been the official ball of the USPTA for over 35 years and is the longest running endorsement in tennis history. Pro Penn+ will be available in July 2008 and will be sold exclusively at pro/specialty shops around the country. Penn continues to be the only tennis ball Made in the USA. For more information, please visit www.pennracquet.com.